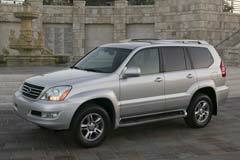 The Lexus GX was first sold in 2002 and it was called the GX 470. The GX is a four-wheel drive sport utility vehicle that is mid-size. This was the third 5-door SUV that Lexus produced and this model is made in Japan. The first generation (2003 - 2009) models had a 4.7 liter V8 engine, along with a 5-speed automatic transmission. In 2009, the company launched the second generation of this model. Now, this model is called the GX 460 which reflects the change to a 4.6 liter V8 engine, and a 6-speed automatic transmission. In both generations, this vehicle was to a great extent based on the design of the Toyota Prado, but its front design was updated to reflect the styling of Lexus. The Lexus GX can seat up to eight people with its two rows of seats, and its optional third row. The second generation vehicles have an interior that is more individualized than the Prado. New safety features were also added that included side torso airbags in the rear and front knee airbags. 2017 GX PREMIUM / NAVIGATION / SPORT DESIGN 2017 Lexus GX, Silver Lining Metallic with 65179 Miles available now! 2006 GX 470 Lexus GX Blizzard Pearl with 81353 Miles, for sale!